This is pretty sweet. The Big Bang Theory is a very popular comedy on CBS, millions and millions of viewers, one of the top shows on TV. Also critically acclaimed, if you watched Peter Dinklage win his Game of Thrones Emmy for Best Supporting Actor you saw the actor who plays Sheldon in this show win Best Actor (in a Comedy) as well. Anyways… so we find out today that they’re using Longclaw as a prop in this week’s episode. We didn’t send this sword to them (knowingly) so we just found out today through a fan’s tip. I have no idea if they will mention the sword’s name, or where it is from, or where to buy it, but the exposure alone is amazing. Can you imagine what product placement would typically cost in a show like that? And it looks like they’re going to be spending time on this sword, it isn’t merely a cereal box sitting on the counter. So we’re really excited. Also, this hasn’t been covered anywhere so I’d mention it here. On last weeks Grey’s Anatomy on ABC they mentioned A Song of Ice and Fire. Specifically one of the doctors was compared to a certain Dothraki princess. This was a bit of a pop culture episode, there was a stampede at a comic convention, so they had other references, such as Lord of the Rings, and Star Wars. That was pretty much it. A Song of Ice and Fire (not, Game of Thrones, they used the book series title). Star Wars, and LOTR. Pretty good company to keep. Westeros is everywhere. Now I’m waiting for Community on NBC to do a themed episode. Oh, this made me smile. Awesome! I don’t even watch the show, but I will for this. Can’t wait. Missed the reference on grey’s anatomy. Of course, I was only watching it because my wife was……. Congratulations Valyrian! This exposure is well deserved! This is great!!! I can not wait to see what Sheldon will compare Longclaw to! Oh gosh. That’s amazing news! Well done. I love the BBT, I love Sheldon and these pictures brought me a big smile. 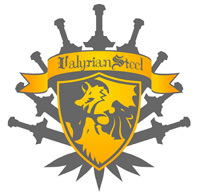 Grats Valyrian Steel! Cool news! I hope one day VS decides to produce an Oathkeeper sword, too! I would totally shell out the money for that. Incredible! I couldn’t believe my eyes when I saw the pics… Big Bang is one of my favorite shows and the fact that Longclaw is going to be in an episode is so exciting! I’m pumped!!! Which version is Sheldon holding, stainless or damascus version? Congrats! I can’t wait to see it! That is one of my favorite shows too! Omg, a Community themed episode would be just flawless! I love The Big Bang Theory and ASOIAF, so this is awesome!!! Can’t wait for the show this Thursday!!! More GoT exposure is always better! Hi must have missed the contact info bit so i’ll just comment here… I’ve noticed that on my Longclaw certficate that there is a possible grammar mistake the extract reads “Passed from father to son, the the hand and a half sword” Is there meant to be two the words? If not can i get another certificate? All the certs have the same typo. Its funny, we read it, the artist read it, GRRM read it, and no one noticed. Things happen. Great episode last night! Longclaw was visible during the entire opening sequence. Even though they didn’t mention the name of the sword they did mention where the sword was from which was pretty cool. Awesome that they chose it as the first sword to start their collection! Haha! I was kind of hoping Sheldon would recite the vows of the Nights Watch!!! “Night gathers, and now my watch begins…. Its says 8000 copies of the sword on BBT when there is really 2500…it would have made more sense to get their facts right! better for the sword to. The writers probably thought 8000 would be funnier. #gameofthrones sword bought in last #bigbangtheory episode will become permanent set dressing. I received ice this summer and I love it! The only issue I have guys is that it did not come with any certificates of authenticity. Can you look into this? Can it be re issued? I just ordered the rest of the pieces you have in production and I am hoping this issue doesnt occur again. Thank you. you’re right though, it’s not a replica of Longclaw from the show. I actually prefer Valyrian Steel’s Longclaw over the one used on A Game of Thrones… Sadly, I cannot say I feel the same way about Valyrian’s Ice or Needle Sorry guys, no disrespect intended… Just personal taste. On the other hand, Robert’s warhammer looks killer!!! What great placement too! Seeing as the cast is always either going or coming from that general direction of the apartment. I think I saw it 3 or 4 times in last nights episode. One shot was a close up of Sheldon and the details of Longclaw were highly visible… enough so that you could read “Winter is Coming” on the plaque! Very cool! Funny, I was just clicking my remote, I happened to stop on BBT I saw the Sword on the wall, then i saw “Winter is Coming” above it… My jaw dropped! I guess I will have to watch that episode from the beginning! What is the Greys Anatomy reference. FRINGE beat out Greys when the time slots clashed so m’lady and I haven’t seen it. What is the ASOIAF reference??? LongClaw is a permanent prop. Very cool. It gets pretty good screen time since it is situated to the right of BBT guys apartment front door and there are lots of scenes with people coming/going through that door. Because Longclaw in the HBO show is based on nothing and this one is based on GRRM’s description. Feb. 7th. Still on the wall! Lol. Did anyone else find it annoying that in the greys reference, the man dressed as an elf compared April Kepnar to “a dothraki princess” and that seeing as she has long RED hair, according the TSOIAF and the tv version Game of Thrones’ portrayal of the Dothraki, the dothraki people are dark skinned with long dark hair, and even if he is referring to deanerys as the dothraki I princess, she has milk skin and silver white hair. So how is April anything like a dothraki princess? !